Jessixa Bagley, author and illustrator of Laundry Day, Before I Leave, and Boats For Papa (winner of the 2016 SCBWI Golden Kite Award for best picture book text) and Aaron Bagley (illustrator of Rocking Fatherhood) have been drawing and writing together since they met in art school more than a decade ago. What started off as a courtship of doodling in sketchbooks and belching in lockers soon turned into a marriage of doodling in sketchbooks and belching with their son. Their artistic partnership is a balanced collaboration of overlapping their individual styles and painting techniques—creating one cohesive language. 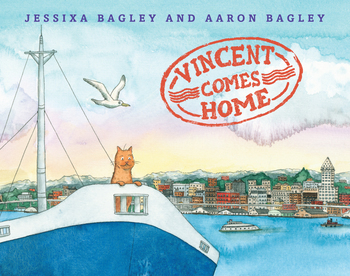 Vincent Comes Home is their first picture book together. And much like Vincent, they have moved around a lot but their home has always been each other.